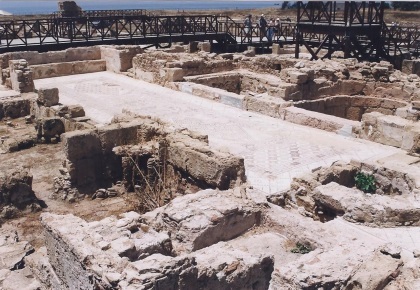 Paphos is an archeological site from Antiquity. It has been inhabited since the Neolithic Age. In ancient times it was known for its Aphrodite-cult: the Myceneans - the rulers of Cyprus at the time - erected temples for this fertility goddess. The site consists of numerous places of architectural and historical meaning: villas, palaces, theatres, forts, tombs and mosaics. Modern Paphos is a beach resort as there are so many in the Mediterranean. It's an unlikely place to find treasures of the past, treasures that are carefully being unearthened. 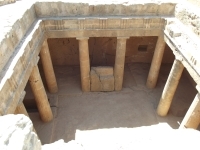 The most spectacular findings are the Tombs of the Kings, graves that are set up like houses. There's a strong Egyptian connection here, and also the comparison with Petra (Jordania) has been made. 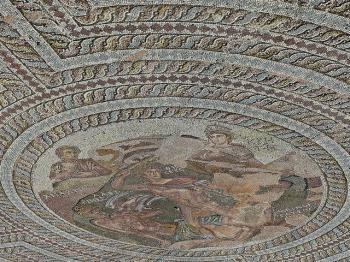 Only a few hundred meters from there, the most beautiful mosaics I have ever seen have been discovered. We're not talking about a few colored stones here and there, but about the floors of whole rooms and even of one total house. An amazing sight. I visited this WHS in February 2016. Although the main site (2 archeaological sites) is close to the Paphos Castle, the other inscribed site, known as the tomb of the kings, is quite a distance away and close to one of the best hotels in Cyprus for afternoon tea. However, this was once a huge uninterrupted landscape and in fact the sheer size of the site together with the good condition of some mosaics and remains make it quite a worthy site in terms of OUV. There are better examples on the list, however it is a very interesting site to visit in Cyprus and the most visited tourist attraction on the island. The marble Unesco plaque is close to the amphitheatre/lighthouse and close to the entrance there was a very interesting exhibition on the avifauna depicted on the mosaic floors which I really enjoyed. Being mainly an outdoor site close to the sea, there are several live bird species you can spot and some of them you can also spot on the mosaic floors. 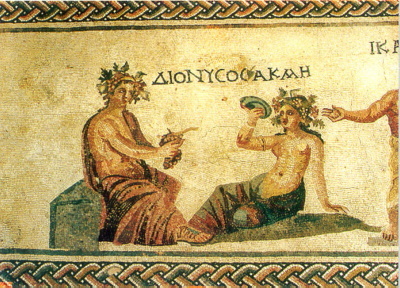 The main mosaics can be visited on an indoor wooden platform at the House of Aion (my favourite being the Triclinium mosaic) and at the House of Dionysus (which houses the largest collection of complete mosaics; my favourite was the rather discoloured one forming the old thermal baths with a stone pluck in the middle). The House of Theseus still does not have an enclosure so its mosaic floors can still be enjoyed with direct sunlight on them (although this won't be for much longer as an enclosure is to be built soon). Here my favourite mosaic is that of the mythical duel between Theseus and the minotaur in the labyrinth of Crete (picture). Moreover, the archaeological park has several geometric mosaic floors, thermal bath remains, irrigation remains, columns, the remains of the Saranda Kolones castle, etc. and most remains are still numbered or are still being excavated. On the other hand, the tomb of the kings is just a minor site nowadays with the main highlight being the underground tomb carved out of solid rock which at times imitated the houses of the living. The name though is quite misleading as no king was ever buried here. Overall, this site is a very relaxing and rewarding afternoon trip to visit when in Cyprus. Another part of this WHS is the Sanctuary of Aphrodite near Kouklia village, just off the highway between Paphos and Limassol. This contains ruins of an ancient temple complex. Paphos is a very touristy city on the Western coast of Greek Cyprus. It features abundant huge restaurants and English pubs which makes it lack any integrity it might have had. The findings for which Paphos got its nomination are of varying significane and quality. Of utmost beauty are its wonderfully preserved mosaics which are the most beautiful ones I've ever seen. They are of such artistic quality that they can be appreciated as art and not only for their historic importance. The other findings in the archaeological park and the nearby port and castle are much less interesting. Another well-known attraction is the Tombs of the Kings (not far to reach by foot). These catacombs are easily accessible and beautifully located along the shore. The old basilica is also worth a visit. What I found less appealing were the caves and Agia Solomoni catacomb which are surprisingly neglected and not that welcoming. The upper town (Ktima) is nice for a short stroll but nothing more. I recently had the experience of viewing the mosaics at Paphos in the snow! I had the benefit of seeing the true colours and found it incredible that they were laid 2,000 years ago. The whole scale of the site was amazing and well worth a future visit. Having the amphitheatre to myself, as everyone else had been put off by the weather, truely was an inspiring experience! Lighthouses: This is a disused lighthouse which stands above a Roman amphitheater in Paphos. It is situated afew hundred meters from the sea. 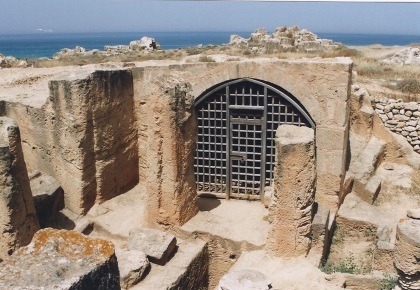 Jewish religion and culture: Agia Solomoni catacomb church is believed to have been once the synagogue of the Roman Paphos. Mosques converted from churches , cathedrals or synagogues: The Great Mosque of Paphos: According to rural accounts, the original building was a church, which was converted to a mosque in 1570 by the Ottoman Governor Mehmet Bey Ebubekir and by the order of Selim Khan, (Selim II). Mosque: Cami-i Kebir (Great Mosque - Aya Sofya) in Ktima (upper Paphos) was converted into a mosque in 1570 or built in 1584 (according to different sources). It is the only surviving mosque in Paphos. Built in the 2nd Millennium BC: The sanctuary of Aphrodite in Palaipaphos dates to the 12th century BC.